ClearView technology provides detection of behavioural risks across all students – including bullying, self-harm and radicalisation. Actionable Intelligence gives schools the ability to see risks for students before they escalate, enabling better and more efficient support to be provided in a timely manner. The unique capability allows analysis of patterns of behaviour and by using evidence-based triggers, design reports and real time alerts of online communication and behavioural trends. CyberHound offers its customers a unique service to identify student welfare issues using its patented ClearView technology. The solution has been used successfully by schools around the world to help develop digital citizenship skills amongst students. The ClearView platform acts as a catalyst to enable enhanced protection for students while at the same time reinforcing the training and policies set by the school around positive digital citizenship. The ClearView Capabilities Defined document is a guide for understanding how ClearView Behavioural Analytics can be an advantage for student welfare . It demonstrates the flexibility to be pro-active to meet your local environment and develop strategies to address emergence of concerning patterns. 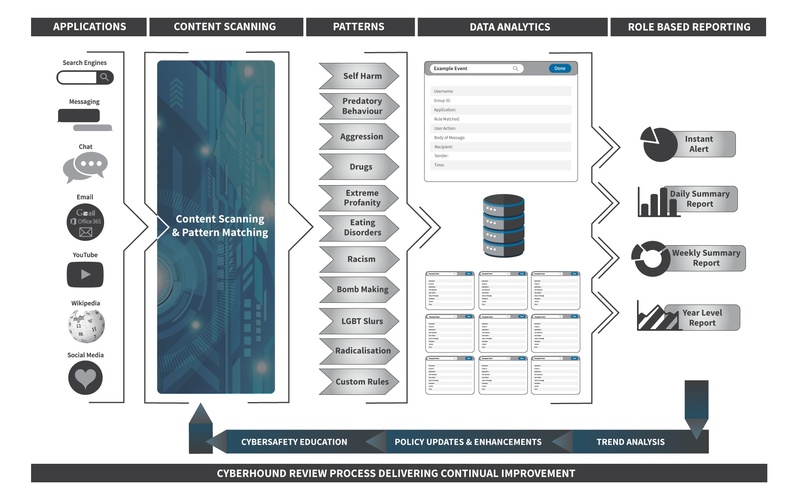 Recognise how the data is captured and through CyberHound’s best practice reporting, review data at a summary or detailed level with the ease to drill-down to investigate patterns warranting further investigation. As soon as the ClearView platform is implemented, it automatically identifies patterns of behaviour that indicate a risk or policy breach. It identifies evidence-based triggers that can support the circumstantial events and intuition of professionals within the school. Early intervention for at-risk students. Proactive student protection or monitoring. Delivery of immediate feedback to promote responsible digital citizenship. Re-training and feedback to a student or cohorts to align with school policies. Developing strategies to address new threats or deal with emergence of concerning patterns. Applying Rules and Actions that meet the school policies. Scanning content for pattern matching to words or phrases as set by the Rules. Collates data for detailed analysis to provide holistic view of the activity. Distributes reporting designed specifically for the user and delivered as required. ClearView scans all internet traffic to identify the most common social media, chat, instant messaging and Web 2.0 applications including Facebook, Twitter, Gmail, Yahoo Messenger, MSN, GTalk and Google Hangouts. It also supports popular search engines including Google, Bing, Yahoo, Wikipedia and YouTube. Once a communication stream has been identified it is directed through the ClearView Policy Enforcement Engine for real-time pattern matching and policy enforcement. Other application controls are provided by CyberHound’s NextGEN firewall capabilities and are managed by Access Policies. ‘Rules’ are set up to trigger the pre-defined patterns and populate the ClearView database. The patterns are words or phrases that are commonly used for searches or communication using the various applications. There are pre-defined ‘Rules’ available, offering best practice implementations and to provide benefits immediately. ClearView provides the flexibility to capture popular expressions; language or trends, specific for your environment, which may affect results. When determining what’s relevant to be monitored, it is necessary to consider what should be excluded or included. Identified words or phrases are easily added to the relevant pattern-searching rule to refine the results. Some on-line activity can trigger results and produce false positives. e.g. A student searching for the movie ‘Suicide Squad’ would trigger the self-harm rule. Creating exclusions greatly reduces the number of results to review. The following example Self Harm report would have been reduced by 6 results if the exclusion had been applied for suicide squad. Scanning the rest of the report would show that the 4 purple suicide results relate to Andy Warhol artwork and could also be excluded for future reporting. This leaves 5 of 15 results that may raise concerns and require further investigation or intervention. By ensuring that Exclusions are continually applied to the Rules, results become refined and relevant making scanning daily reports quicker. While it is important to remove unwanted results, there may also be a need to capture new popular expressions or words, or words that cause concern, which do require monitoring. Adding specific words or phrases to the Rule/s, will ensure that important trends or concerns can be captured and reported on. Fights – organised in a nearby park can be monitored easily by adding the name of the park to the Aggression rule. Drugs – new slang or street names that can be added to the Drugs or Self Harm rules. Actions determine what needs to happen when the rule is triggered. There can be more than one action executed when the rule is triggered. The following are named actions that typically apply to ClearView Events and are available to use for the Rules. Alert and report – On-line activity is NOT interrupted and triggers an immediate email to the nominated person/s. Suggested Use: when you don’t want to stop an individual from searching as there may be a need to monitor and have visibility to their activity to assist with solutions and actions e.g. Eating Disorders. Report Only – On-line activity is NOT interrupted and details are captured in ClearView database. Most commonly used action as the data captured is provided in scheduled reports for review at convenient times. Block and report – On-line activity IS interrupted and details are captured in ClearView database. Using block messages does indicate to network users that the school has policies in place to stop particular on-line activity. Individuals may then seek other avenues in the future, resulting in no visibility of inappropriate on-line activity. Consequences of blocking on-line activity may be loss of early intervention, protection capabilities and missed opportunities for education on responsible on-line behaviours. ClearView’s data source captures the patterns triggered by the Rules and at the same time, information that makes analysis and drill-down details easily understood and provides context about an activity. It provides flexibility to review the results using other ‘Conditions’ to complete the picture and determine what actions or support are required. Following are the most relevant conditions used in reporting. ‘Conditions’ can also be defined by inclusion or exclusion selections. Summary section provides a high level view of Rules Matched, for all ClearView events and indicates which Action is currently applied to the Rule. Reports can be displayed with or without Graphs. The summary report totals user actions for Searches, Sends and Receives against all the ClearView Rules. These key actions provide behavioural analytics to help prevent and identify issues concerning the safety of students. Details of the totals are contained within the report with the ability to drill-down to a singular event via the See Query links. The Report provides information for the range of patterns to provide details to scan for activity that may require further investigation. The report also identifies if there was no activity for specified period. Results for SEARCHES provide insight into a users behaviour and interests which may highlight potential at risk situations. SENDS or RECEIVES results are combined to provide activity patterns. Who SENT an inappropriate message and who RECEIVED the message, aids in detecting a pattern or commencement of inappropriate behaviour which can be addressed before it escalates. One exception is Predatory. 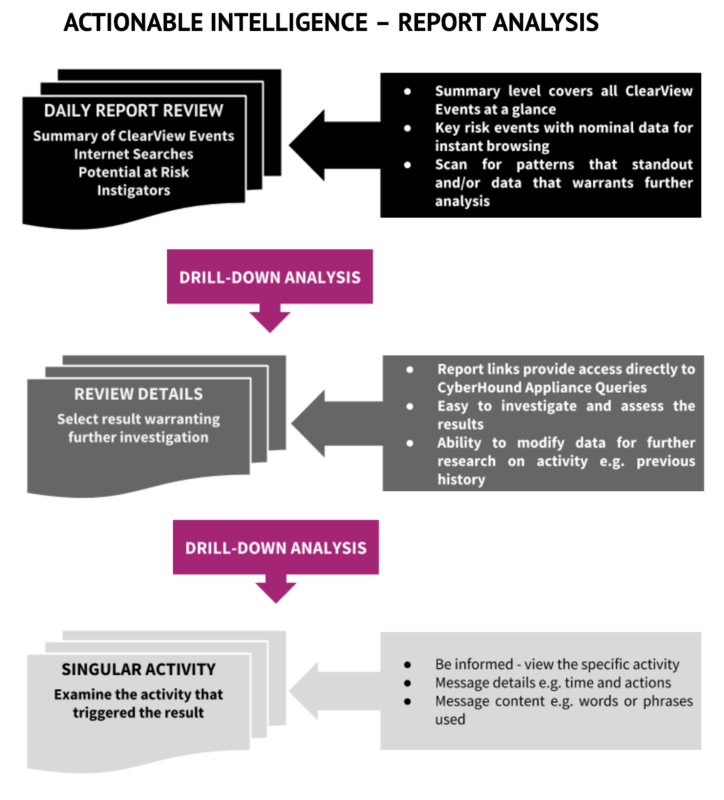 Clicking on the ‘See Query’ from the report provides access to CyberHound to view the data and modify for further drill down and investigation of the activity. The Query could be modified to search on any parameter e.g. one user over a different period of time or more data results, different headings. Add a condition to exclude the false positives that have not been excluded from the rule as yet e.g. purple suicide. Clicking on ‘[More]’ from the results view or the report, provides access to see the details for that singular event. If covers all the message details including the content of the message. Find out more on ClearView.